Passion Pit are curating their own gig at Korova on Thursday and we’ve two tickets and two exclusively designed T-shirts to give away. 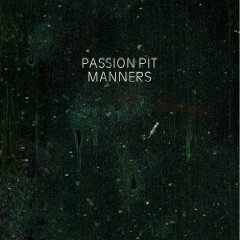 Massachusetts cats Passion Pit are one our big faves of the year. Look here’s proof. So when we heard Topman were offering two tickets to a gig hand-picked by the band and two (of 50) t-shirts exclusively designed by them too, it was an offer we weren’t going to sniff at. 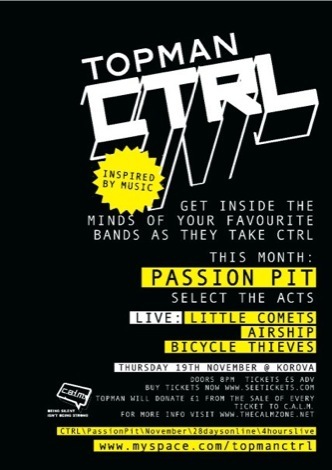 As part of the Topman CTRL Series, Passion Pit have selected a fine mix of emerging talent including Geordie indie-pop quartet Little Comets, Manchester’s Airship and fresh from their winning set at Dubai Sound City and the launch of their new single, Liverpool’s Bicycle Thieves. All the action takes place at the new Korova on Hope Street, Liverpool on Thursday. To win a pair of tickets to the gig and two T-shirts email peter.guy@liverpool.com by Thursday 4pm, with the answer to this question. What is the name of Passion Pit’s debut long-player?